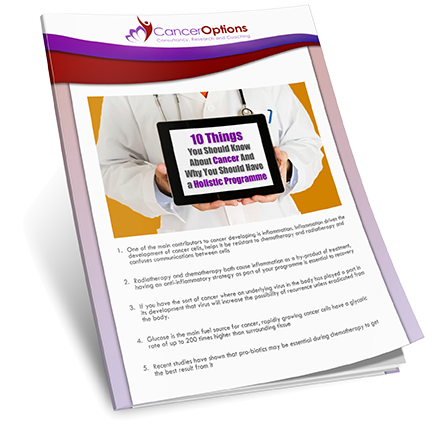 How Can Cancer Options Work for You? We have different services to suit different needs. If you are having treatment, want to recover from treatment, regain weight and energy, or have hormone support we can design a programme for you following completion of a questionnaire. This will be with you quickly enabling you to get on with supporting yourself straightaway. If you want to discuss any elements of treatment you have been offered or need a chat about anything that has been brought to your attention and want an impartial opinion on, then our telephone, skype or email consultancy is right for you. For a full review of your situation, a look at all potential orthodox and cam approaches, and a full integrated programme devising for you then our full consultancy is the one to go for. We do an hour and a half’s consultation via telephone, skype or in person. Once I know everything about your situation and more importantly you we can discuss all viable options and begin our three step programme to helping you get yourself back on track. If you are unsure about what is the right approach for you please either fil in the enquiry form or call us and we will be very happy to have a chat and work out the best strategy for you. For quick and easy access to treatment support our online service will provide you with a tailor made programme to help you through a particular stage. Complete the online questionnaire and you will be able to get your support programme going quickly and easily. If there are any elements you wish to discuss or need further support we will provide that for you either by telephone or email, whichever suits you best.